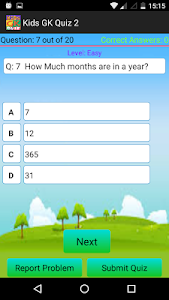 Kids GK Quiz (General Knowledge Quiz) is a unique game in which kids can easily learn about the general knowledge with little fun and play mode. Kids can be excelled in general knowledge related questions. This learning game is also worth trying for Adults as well. Lets go.. why not.. give a try now. It always good to learn with play. The questions in Kids Quiz are not timed, giving your child the opportunity to identify picture, while learning and gaining an understanding of intermediate to advanced subjects. 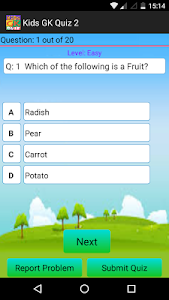 Kids Quiz easy-to-use interface allows children of all ages to interact easily with the app, makes Kids Quize especially practical, yet so entertaining, children will forget they’re even being quizzed! 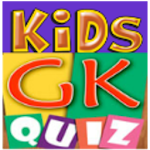 Kids GK Quiz (General knowledge) has approximate more than 400 questions in different questions. - Multi Student adding facility to start competition. - Good Images and animation. - Sound System as well. Download now, learn , play and have fun! 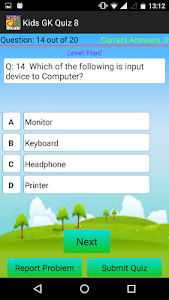 Similar to "Kids GK Quiz"